Intense gel treatment that's brilliant at post-shave soothing. 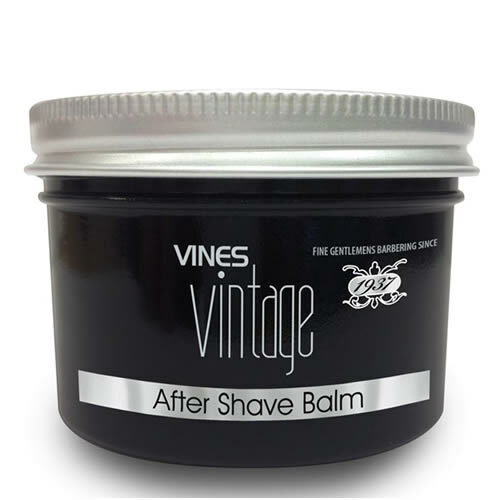 Vines Vintage After Shave Balm boasts an intensely rich gel formula that hydrates and soothes dry, just-shaven skin with a calming blend of Witch Hazel and Jojoba oils. The formula has also been infused with extracts of Argan Oil and replenishing Vitamin E.
Give your clients' just-shaved skin some proper TLC! Available in a 125-ml pot. Attractive shaving set that consists of DS1 double edged safety razor, shaving brush, stainless steel shaving bowl and stand. Features beautiful hand-crafted wooden handles on razor and brush. High quality badger bristle shaving brush from Jack Dean that adds a touch of luxury to your wet shave service. Has exceptional water-retention capacity and smooth touch. Synthetic shaving brush with features soft filaments that produce a rich, creamy lather every time. Attractively designed with a smart black finish.